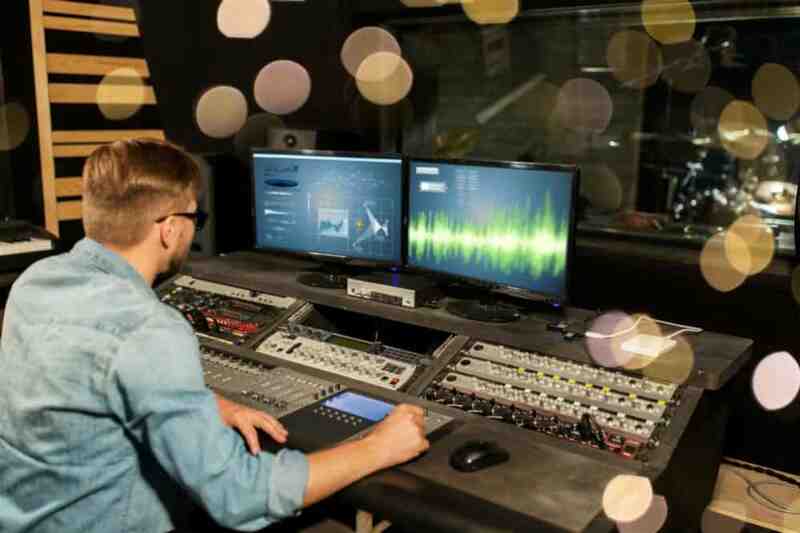 Kitting out your recording studio with the equipment you need is not only an expensive process but also a time-consuming one. This is mainly because there are lots of brands and options to choose from every step of the way. Owning good studio monitors will be vital in ensuring that your mixing, mastering, and sound production is of the very best possible quality. Keep reading for an in-depth review of the Neumann KH 310 Studio Monitors. We take a look at what features makes these monitors stand out from the crowd, and what kind of studio setup they would be suitable for. Founded in Berlin in 1928, Neumann is quite often featured at the top of must-have professional sound equipment lists due to their legendary microphones. Since 2010, Neumann has also been lending their audio expertise to the studio monitor market. This is very much evident in their well-loved KH 310 Studio Monitors. These top of the range studio monitors are best suited to the more serious sound engineers out there, as well as those with the money to spend on their home studios. They can be used as near-field or mid-field monitors, which means that they are fit for wall-mounting in professional studio setups, as well as smaller projects and home studio settings that don’t have proper acoustic cladding on their walls. The KH 310 monitors are also supplied with the main cables for the U.S., Europe, and the U.K., making them suitable for most locations in the world. These studio monitors come as a package deal, so you actually get a left and right monitor for your money. The delivery will be quite large—weighing over 70 pounds. This means that you have to ensure that you have the room for them. Stands that are robust enough to deal with their weight would also be good investments. These studio monitors feature a tri-amp, three-way setup, meaning that the sound is delivered via three separate speakers instead of just two. Each of which is powered by their own amp. This provides superb sound quality with the addition of a dedicated mid-range speaker. The mid-range speaker will handle most of the sound that is familiar to the human ear (such as voice). Having a separate amplifier that powers each of the woofer, mid-range, and tweeter speakers mean that you’re less likely to suffer from speaker damage from amplifier overload. The tri-amp setup will also reduce the chance of intermodulation distortion. As a result, you get a more “uncolored” sound, which is precisely what you should aim for. This type of power will not only provide you with incredible volume but also better definition and clarity. This is especially evident at higher frequencies (such as those coming from snare and kick drums). These monitors will provide fantastic bass even without a separate subwoofer. This is because the lower frequency starts at 34Hz. The mid-range driver also has a fabric dome with a neodymium magnet, which, due to the fact that it’s lightweight, has a better transient response and less breakup than speakers with cone designs. The super strong neodymium magnet will reduce harmonic and intermodulation distortion. The alloy fabric dome on the tweeter will help to create an accurate reproduction of high frequency sounds with minimal distortion. 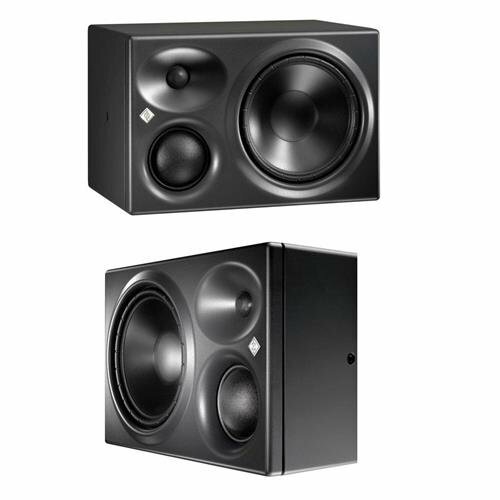 With wide horizontal and narrow vertical dispersion, the KH 310 studio monitors have been designed to suit both small and large studio spaces. What makes this possible is the fact that their sound quality will be less affected by their environment. Mixing at a large format console with other monitors can mean that the sound changes depending on where you are positioned at the console, and sound waves can sometimes bounce off the console or your desk. Neumann’s monitors provide a smoother off-axis response, thereby widening your “sweet spot”, allowing for excellent sound quality across a more extensive and more diverse space. The KH 310 monitors are even more adaptable to various different acoustic environments due to their easy-to-use, four-position bass, low-mid, and treble acoustic controls. The monitors come with various integrated mounting points, making them easy to hang or place wherever you need them in order to give you the best sound, while also making the best use of your space. What’s more is that the KH 310 also have self-adhesive feet, which help to increase their stability when mounted on speaker stands. These studio monitors are incredibly easy to hook up to your console and start using straight away. Due to their versatility (and the elliptical MMD), they are very easy to place in the room as their sound dispersal field is wide horizontally but narrow vertically. This means fewer chances for your sound bouncing off your ceiling or console. If your budget doesn’t quite stretch to the Neumann KH 310’s price, or maybe you just don’t have the space for them in your studio, then you could consider the Neumann KH 120 Studio Monitors as an alternative. Throwing out 100 watts in total, this bi-amp, two-way monitor won’t provide you with the quality and volume that it’s big brother does, but it does still pack some impressive statistics when it comes to precision manufacturing. The monitor’s tolerance is designed to +/- 0.5dB, giving you incredible and true frequency volume used as a pair. Although, as a standalone, this precision decreases to +/- 3dB. The speaker enclosure is compact, making it more suitable for smaller spaces. It is made of very sturdy aluminum, eliminating any unwanted coloration that can be caused by weaker cabinet builds. The titanium fabric dome tweeter will also produce minimal distortion at higher frequencies. The frequency response starts at a relatively standard 52Hz. This means that you’ll probably also need a subwoofer if you plan on doing much bass production work. The Neumann KH 310’s tri-amp, three-way setup, as well as the 290 watts of power, will provide minimal coloration on your sound. As a result, you get to enjoy a fantastic volume and definition on your audio. The elliptical MMD and four-position bass, low-mid, and treble acoustic controls mean that the monitors are incredibly versatile to their environments and can be placed almost anywhere in the room (within reason) for amazing sound quality. While the Neumann KH 210 has clearly high-quality specs and build, it doesn’t even come close to the KH 310 in terms of sound quality, versatility, volume, and bass. Hence, if you have the money and space in your studio, then we strongly recommend the Neumann KH 310 as the ultimate studio monitors.